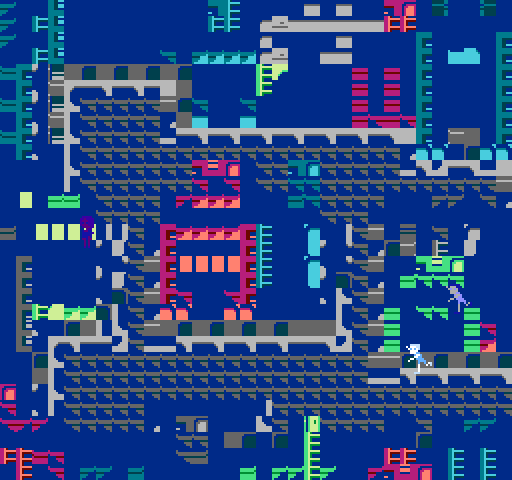 Working on a NES game you are treading in the footsteps of programmers from the 80's, and going back to modern development feels strangely bloated and inefficient in comparison. This is a log of some of the things I've encountered writing game code for the What Remains project. Firstly, although it seemed like a lunatic idea at the start, I'm very happy we decided to build a compiler first so I could use a high level language (Lisp) and compile it to 6502 assembler that the NES/Famicom needs to run. This has made it so much faster to get stuff done, and for example to be able to optimise the compiler for what is needed as we go along, without having to change any game code. I'm thinking about how to bring this idea to less projects on less esoteric hardware. These are the odds and ends that I've built into the game, and some of the reasons for decisions we've made. As well as sprite drawing hardware, later games machines (such as the Amiga) had circuitry to automatically calculate collisions between sprites and also background tiles. There is a feature on the NES that does this for only the first sprite – but it turns out this is more for other esoteric needs, for normal collisions you need to do your own checks. For background collisions to prevent walking through walls, we have a list of bounding boxes (originally obtained by drawing regions over screenshots in gimp) for each of the two map screens we're building for the demo. We're checking a series of 'hotspots' on the character against these bounding boxes depending on which way you are moving in, shown in yellow below. You can also check for collisions between two sprites – all the sprites we're using are 2×2 'metasprites' as shown above as these are really the right size for players and characters, as used in most games. These collisions at the moment just trigger animations or a 'talk mode' with one of the characters. We are already buffering the sprite data in "shadow memory" which we upload to the PPU at the start of every frame, the entity list provides a second level of indirection. Each time the game updates, it loops through every entity converting the world position to screen position by checking the current scroll value. It can also see if the sprite is too far away and needs clipping – the simplest way to do that seems to be simply setting the Y position off the bottom of the screen. In future we can use the state byte to store animation frames or game data – or quite easily add more of these as needed. Obviously I was itching to write a custom sound driver to do all sorts of crazy stuff, but time is very limited and it's better to have something which is compatible with existing tracker software. So we gave in and used an 'off the shelf' open source sound driver. First I tried ggsound but this was a bit too demanding on memory and I couldn't get it playing back music without glitching. The second one I tried was famitone which worked quite quickly, the only problem I had was with the python export program! It only requires 3 bytes of zero page memory, which is quite simple to get the Lisp compiler to reserve – and a bit of RAM which you can easily configure. I wrote before about how you need to use a display list to jam all the graphics data transfer into the first part of each frame, the precious time while the PPU is inactive and can be updated. As the project went on there were a couple more primitive drawing calls I needed to add to our graphics driver. To display our RPG game world tiles, the easiest way is putting big lists describing an entire screen worth of tiles into PRG-ROM. These take up quite a bit of space, but we can use the display list to transfer them chunk by chunk to the PPU without needing any RAM, just the ROM address in the display list. I'm expecting this will be useful for the PETSCII section too. I also realised that any PPU transfer ideally needs to be scheduled by the display list to avoid conflicts, so I also added a palette switch primitive too. 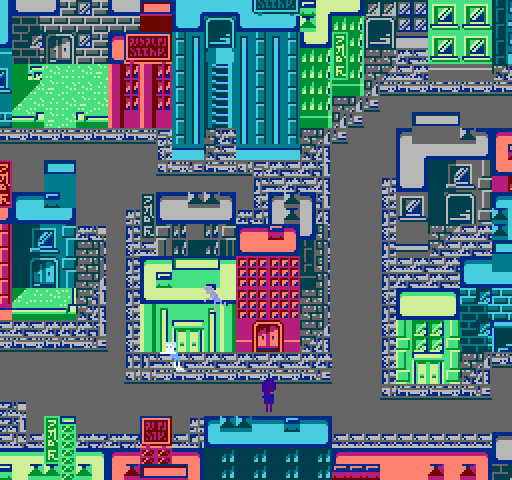 We are switching palettes quite a lot, between each game mode (we currently have 3, intro, RPG and the PETSCII demo) but we're also using an entirely black palette to hide the screen refresh between these modes. So the last thing we do in the game mode switch process (which takes several frames) is set the correct palette to make everything appear at once. By default you get 8K of data to store your graphics – this means 256 sprites and 256 tiles only. In practice this is not enough to do much more than very simple games, and we needed more than this even for our demo. The fact that games are shipped as hardware cartridges meant that this could be expanded fairly simply – so most games use a memory mapper to switch between banks of graphics data – and also code can be switched too. There are hundreds of variants of this technique employing different hardware, but based on Aymeric's cartridge reverse engineering we settled on MMC1 – one of the most common mappers. In use this turns out to be quite simple – you can still only use 256 tiles/sprites at a time, but you can switch between lots of different sets, something else that happens between game modes. With MMC1 you just write repeatedly to an address outside of the normal range to talk to the mapper via serial communication – different address ranges control different things.